This is a fairly short post to announce in this blog a somewhat major point in my life: I have officially graduated from high school! The official graduation day was 29.5. or 30.5., but since I do not live anymore at the city where my school is, I did not participate the graduation ceremony. But I did visit Turku last Wednesday, 3.6., for my university entrance examination (more about that later!). 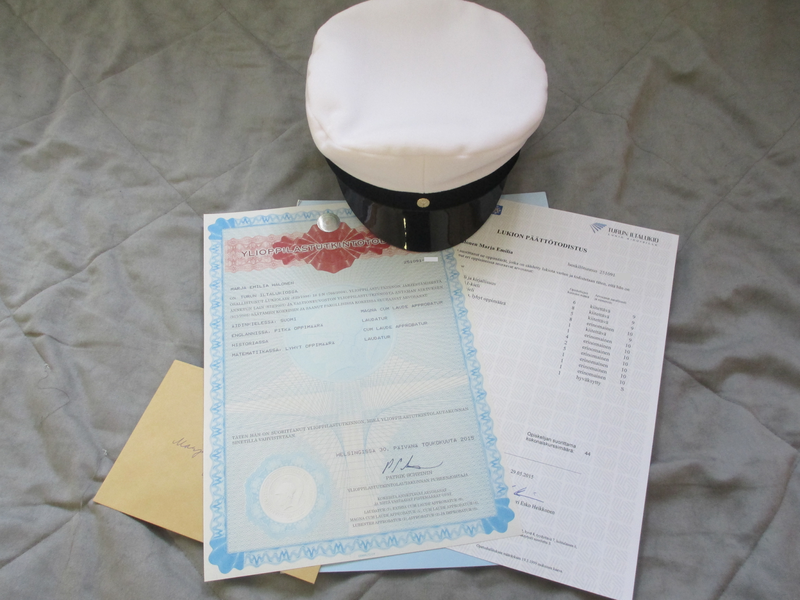 While I was there anyway, I had arranged for me to go pick up my certificates and hat from the school, so I received them few days ago. 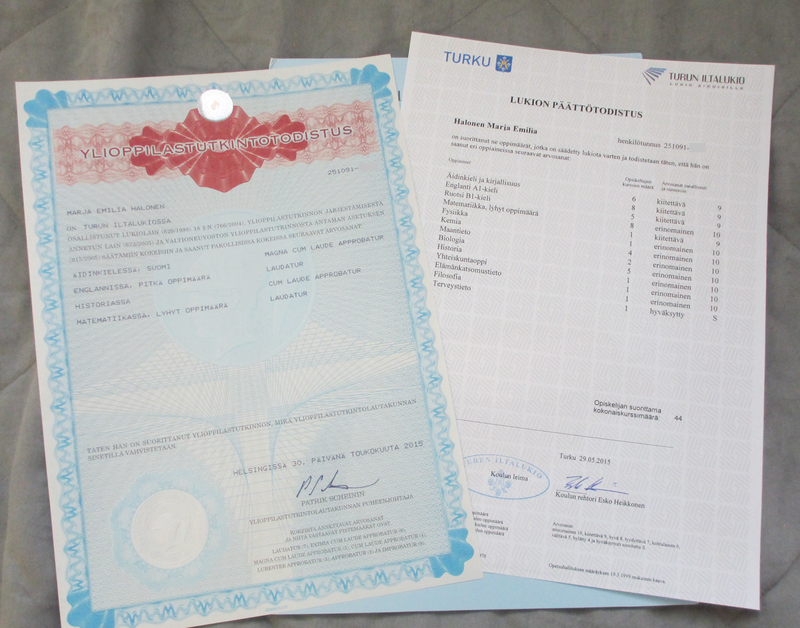 I am very pleased with the grades I received and many people have been quite surprised by how well I did. When I went to pick up my hat and certifications, I was actually surprised: I received a stipend for doing so well in the school!! I was really taken back, since I had not expected this at all! It was not any huge amount of money (in my opinion it was a lot, but overall), but it was more of a symbolic value to me, since I have never received any stipends or such. I am afraid that I was so stunned, that when the office clerk handed the stipend to me, I did not show any gratitude for receiving it. Which is definitely not the case, since I am very happy and thankful for receiving it! Nordic fact of the day: When Finnish students (I believe this is the case with other Nordic countries too) graduate they receive a student cap to commemorate the occasion. Or actual students buy them themselves or their relatives buy them one. In my case, I received my cap from my school for free, since there is a foundation who donates those to all the students from my school. The hat is usually worn at May Day celebrations, which in Finland celebrates workers and students. It feels kind of weird that this part of my life is over now. I still can remember when I was just considering the option of going to high school, around three years ago. Three years felt like a forever then, but I am surprised how fast in the end it went. As cliché as this may sound, but I learned a lot in the school and (as hard as it may be for me to admit) I think I grew up as a person, even though I was already an adult when I started. At least I learned that I can be a good student and learn things properly. I learned a whole new language (okay, I studied Swedish in primary school too, but could not remember anything when entering high school studies) and found out I am actually very good at mathematics. I learned appreciation towards physics and chemistry; I still do not like them, but understand more (my physics number went up from primary school 5 to 9, and chemistry from 7 to 10!). And most importantly my GPA went up from primary school 7 to 9.7 (9.666666666666667 to be exact)! This was the most important thing to me, since I went to high school just to get good papers, in order to get into an university. I have applied throughout the years to different schools with my primary school papers (vocational schools, obviously not universities), but since they have been bad (Just to clarify, the highest grade mark in Finland is 10, 4 being lowest with 5 being the lowest pass grade.) I have not usually been even invited to entrance exams. I believe with these papers I should be getting into an university! I think that is all I wanted to write! I know I said in the beginning that this is going to be a fairly short post, but it seems I had more to say than I originally thought. Well, three years is a long time, so of course there is things to say about that time. Since this blog kind of wants to also introduce the Nordic culture and lifestyle, I want to write more about Finnish (high) school system. I also feel like writing some kind of motivation post, even though I tend to not like those. And also that university entrance examination post is coming up. So more about this subject is yet to come!